I’ll never forget the hiring manager who interviewed me between bites of his Philly cheese steak. Or the rejection letter I received two years after applying for a job, addressed to some guy named John. But I’ll also never forget that smiley receptionist who knew my name when I arrived to interview. Or that candid recruiter who called me with feedback that stung, but changed me for the better. Ah yes, the candidate experience – everyone knows good ones can win candidates, and bad ones can drive them away. Is this another post about the importance of treating candidates like customers? Not exactly. This is the first in a series of interviews with talent acquisition leaders who are nailing the candidate experience. First up is Rapid7’s Ed Nathanson. What prompted Rapid7 to focus on candidate experience? We compete with big names for talent, so we have to differentiate ourselves where we can. Having a unique hiring process helps us attract high-quality candidates who fit our culture. 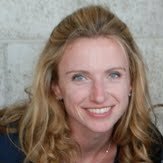 Who owns candidate experience at Rapid7? We actually have a rock star candidate experience person – Theresa Kim. Her sole focus is to make our hiring process as good and authentic as it can be. 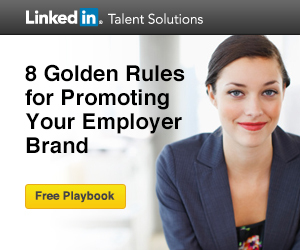 How does your employer brand come through in your hiring process? We play up our scrappy personality at every interaction. We ask unconventional interview questions - e.g., ‘If I gave your team truth serum, what would they say about you?’ or “What is the single most important factor that must be present in your work environment for you to be happily employed? What were two others that you debated about before giving the response that you chose? We walk candidates around our offices so they can get a feel for the culture – they see the energy and interaction of our team. And the occasional nerf dart flying across the desks. We send candidates homemade parody videos, and the list goes on. Our goal is to help the right people identify this as home. We’re not for everyone, but if we’re for you, it should feel like a fit very quickly. 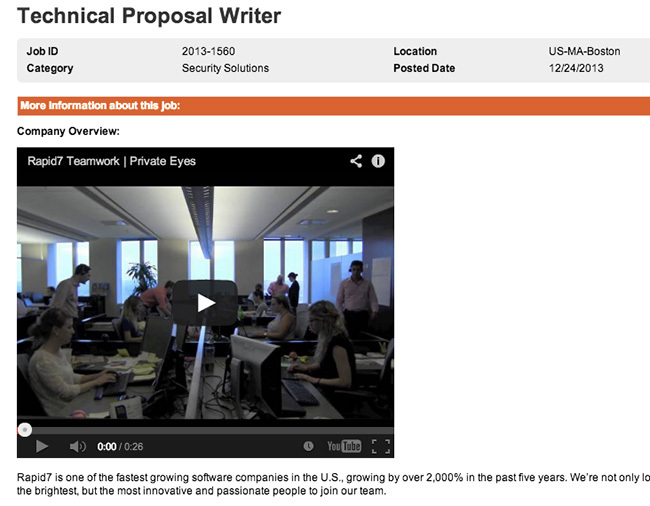 Check out Rapid7’s job description for a Technical Proposal Writer. Yes – that’s a video in the Company Overview section! What else do you do to stand out? We often get feedback saying, ‘I can’t believe how many people came by when I was sitting in reception and asked me if I needed anything.’ That’s not by accident – the entire Rapid7 team is very attentive and engaged. And we all want to make sure our candidates feel comfortable and welcome. We also try to make our application process as quick and intuitive as possible. 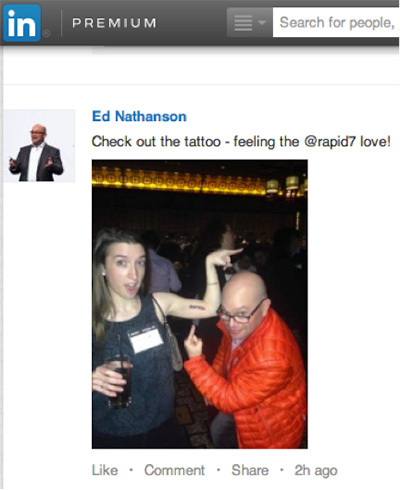 Rapid7 invites candidates to “Apply with LinkedIn” and other social media profiles. How and when do you communicate with your candidates? We acknowledge every application. Anyone we talk to gets a personalized email. Anyone who comes in gets a phone call. We always try to be consistent and set expectations about next steps. If it’s not a fit we ask to stay in touch via LinkedIn. Our attitude is, ‘If you see something you like, share it. Do something fun. Take a picture and tweet it out. Talk to people.’ All we ask is that they be relevant, responsive, and real. How do you work with hiring managers? How do you know if your efforts are working? We survey candidates and review the results at least once a quarter. We honestly read every comment. We’ll often follow up with candidates one-on-one too. We are constantly asking what we can do better, and making changes along the way. How friendly was the receptionist? I instantly felt comfortable; goodbye to interview jitters. Moderately friendly – A hello with a smile. It was sufficient. Did you feel the Rapid7 culture was accurately portrayed by the people you spoke with? No, the environment didn’t jive with my chi. What has been the impact of your candidate experience efforts? Our time to hire has dropped dramatically because our candidate self-selection is so effective. We’ve also built up our talent community, from 1500 LinkedIn followers to 9000+ in just two years. And our hiring process approval rating is 80% and growing. Ed hit on some key factors that differentiate a good candidate experience from a great one. You can start dialing these up today – most don’t cost a dime. Duh, right? Yes, but it bears repeating because so few companies are consistently nice. Warm and friendly interactions are what make rejected candidates still want to work for you. Treat candidates like guests in your home. Share hiring manager profiles with candidates to humanize the process. Invite candidates to connect on LinkedIn and post status updates to stay visible. 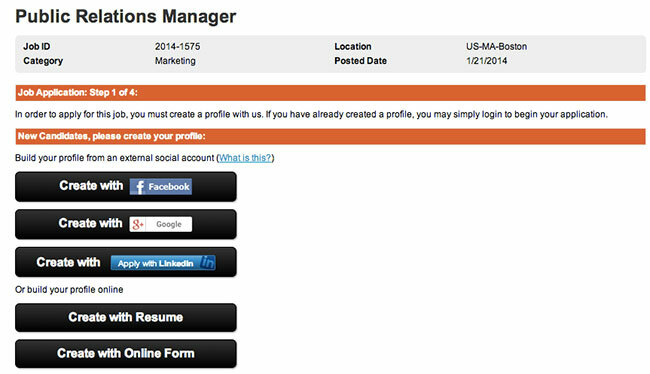 Make it easy - let candidates apply with their profiles. Teach hiring managers how to answer common questions. Use LinkedIn profiles to brief them on candidates. Assign each interviewer a different focus so candidates don’t have the same conversation five times. The more prepared you are, the more comfortable your candidate will be. Listen to your candidates. Ask them how you are doing both via survey and one-on-one. Own up to weaknesses and most importantly, do something about them.